The Los Angeles startup Give Back Box has made donating goods to charity an absolute no-brainer. Already owning a successful fashion ecommerce site called StyleupGirl, entrepeuner Monika Wiela wanted to do more good through her business. Her idea was that whenever a shopper receives a box from an online order, they would then fill the empty carton with goods and donate it to a local charity. This simple premise has been put in motion through partnerships with big organizations like Overstock.com, Anne Taylor, and Goodwill Industries. We spoke with Biz Debnath, who spearheads Give Back Box with Monika, to learn more about where the idea came from and the impact it is having on how shoppers think about boxes. How did Give Back Box get started? It was a merging of passions. When Monica and I met, I knew that she had a great talent with shoes and had a successful business in Poland. So we started StyleupGirl. She looked after the sourcing and fashion side, and I looked after the operations side. We you are doing a startup, it’s like a baby. It doesn’t pay you, but it needs to be fed every hour. And it doesn’t behave the way you want it to behave. You try and bring as much control as you can. We started thinking, “what will make this company different compared to others?” We both agreed that we needed something. Whatever it is, we both knew that it had to be something that does good. It’s not about making money. It’s not a gimmick. So we piloted that with StyleupGirl to see if people wanted to donate. We partnered with a local charity in Chicago. We had people sending the boxes back to us, and we were taking it to the charity. I think we sent out about 100 flyers, and paying for it ourselves, and we got back around 50 boxes. We were amazed. Monica even cried. People were literally writing personal thank you messages on the boxes. In one box there were over 44 items. It seems like a no brainer to use Give Back Box for donating. Can you speak to how important it is for charities that companies and customers get involved with using Give Back Box? Once we knew it was proven, that people wanted this, we went and talked to bigger charities. We asked what their biggest issues were. They said they said it was actually getting donations. I was surprised, since I had thought it was the selling of the donations. I realized there was a bottle next. In a report from NPD, in 2011, that says an average household has $7000 worth of goods they don’t need. When you look at these charities and the thrift industry, like Goodwill, Habitat for Humanity, and Salvation Army, they only get about 2% of that unwanted goods. This concept was going to allow charities to get more of that. The more I looked at the issue around helping the charities; the more I realized it was a massive domain. About 50% of the US lives paycheck to paycheck, and may live on the bread line. We knew that Styleupgirl alone was not going to be able to make a dent. That is when we started seeking partnerships. We needed this to be a global thing, where everybody uses it. It works like this: Anne Taylor promotes us on their website, and puts our flyer in the box. It instructs them not to throw away the box, and to please donate using the box. The first fliers they put in the box even told them that now that they bought something new, they should get rid of the something old. 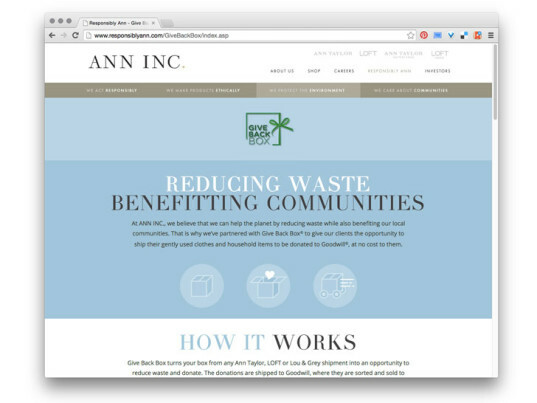 They now onto the Anne Taylor website and it explains what the call to action is and they can enter their zip code. 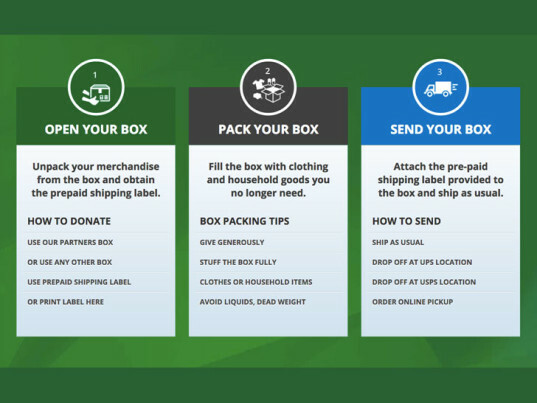 In the click of one button, it gives you a shipping label for your local Goodwill. How did you go about getting partnerships with companies? Was partnering with fashion companies a focus? This is a really pertinent question. Basically, you get a pen and paper, and write out a list of all of the people from the companies and charities that you need to contact. We hounded them in LinkedIn. We found out who to talk to. We just started calling them. Partnering with fashion companies was not the main focus. Our only requirement was anyone who uses a box [to ship]. We started to realize that not only are we helping people, but we are recycling and reusing. We were talking to companies about the many angles; about helping people gett rid of things they don’t need, about recycling and not letting the boxes got to landfill with their branding on the box. Customers complain the boxes are too big as well. There are a lot of issues for online retailers with cardboard boxes. With online retail growing, the issues will only get bigger. It works very well with environmentally conscious companies. There is a lot of interest. Our latest one was Anne Inc., who runs Anne Taylor and Loft. We have many others in the pipeline. People see this, and it is central to what they do in ecommerce. It fits with their corporate sustainability initiatives. One of our first companies was Overstock.com. Patrick Byrne, who is the chairman and CEO, is the most incredible people I’ve ever had the chance to meet. I wrote Patrick an email and said “I hear you like to go the greatest good for the greatest number of people. If that is the case, you will definitely be interested in what we are doing.” He forwarded it there and then to the head of their marketing. Our relationship began immediately. On the charity side; where I was very impressed, was with Goodwill wanting to put people into jobs. Its like giving people the means to fish. It goes well with our ethos. Given that we wanted to help many people nationally, it was good that they have many locations. A major part of sustainability is that we didn’t want people do donate and have to ship it from California to New York. It wouldn’t be good with the carbon emissions. We wanted someone who has presence in communities, so you can donate directly. Give Back Box is social enterprise, not a charity. Can you tell us more about what that means? A social enterprise is basically a profit making company, whose objective is to help; not just to make money. A B Corp is a social enterprise, is an entity positioning. That positioning is less important than the vision of the company. You can set yourself as a B Corp, but if helping isn’t rooted in the vision and strategy, it’s going to get a gimmick. What is your vision for Give Back Box? If you can imagine it five years from now, what would success look like? Our vision is “No Box Left Behind”. Another thing we like to say is “Give a box a life, give someone a second chance.” Every time you see a cardboard box you will think about what you can put inside. We want to change the way people see a cardboard box. We want to change the way people donate. With the $7000 of unwanted stuff in homes, that is over a trillion dollars of donations sitting out there. People’s intentions are good, but there are lots of things we have to do. We are giving people the means to donate. Its people like you and me talking about it that is going to get the word out there. The more people see how convenient it is, and it doesn’t cost them anything. Even if they drove to the Goodwill, they would have to pay for the Petrol. We just want them to look inside their garage and wardrobe for those things that they never touch, and change their mindset. We want people and companies to think differently.